with all the wellness pieces. 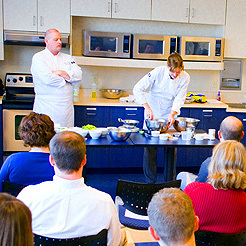 Created by recognized experts in the areas of cooking, education and health, LifeRecipe® unites the elements companies need to make wellness a priority: from on-site cooking experiences to user-friendly resources that empower employees. It's customized to your company, fairly priced, and 100% flexible: bring LifeRecipe® to everyone in your organization,or start with a few employees and watch the benefit spread. ©2012 LifeRecipe. All rights reserved.